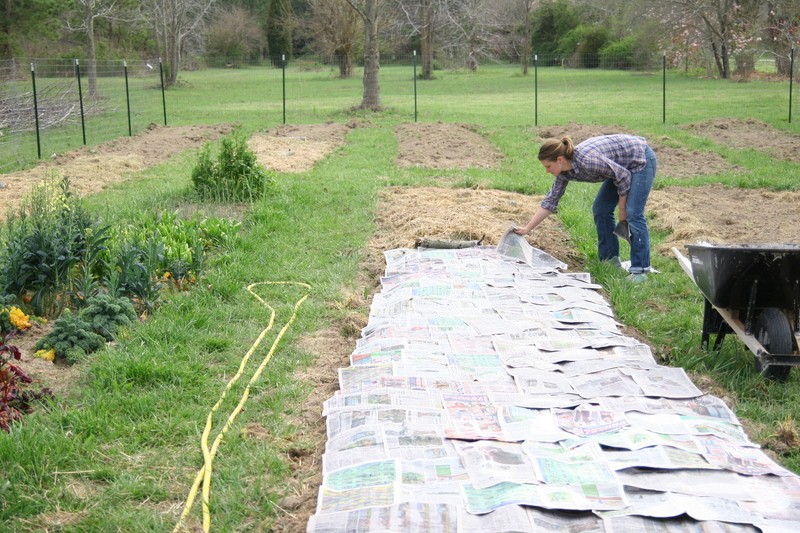 We’ve been working hard on the garden, putting down newspaper and cardboard and topping with grass mulch. This sure takes a long time (in part because we have to keep mowing to make more mulch), but seems to be working. I have seen nary a weed or blade of grass growing through the paper. Our daily routine begins with coffee and a quick processional into the brisk morning as we bring our trays of seedlings so they can enjoy a full day of sunlight. We don’t have a greenhouse yet, and with all of our other projects going on couldn’t muster the energy to fashion a cold frame to protect the little plants from cold nights. So, instead we bring them in every night and set them out each morning in the driveway for a little sunbath. Seeing as how a fair portion of my week is spent primping our garden, I have begun to feel a bit anxious about the sorry state of our seedlings. 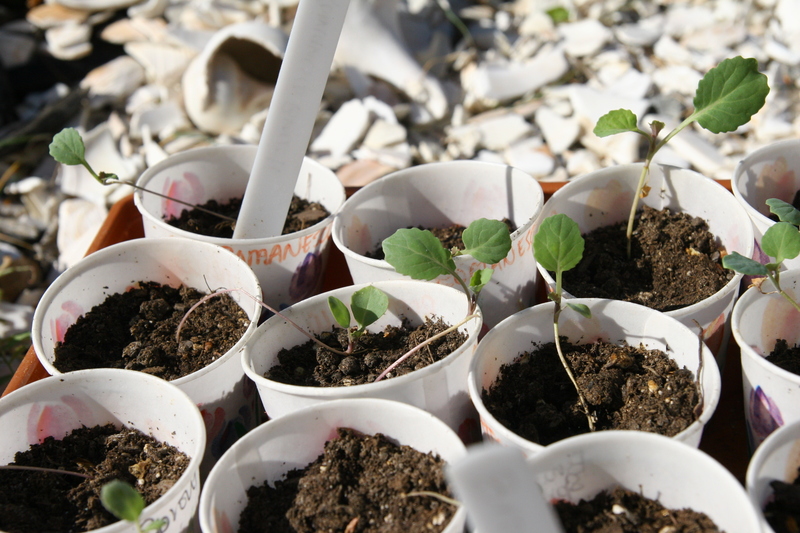 The first seeds were started in early February. 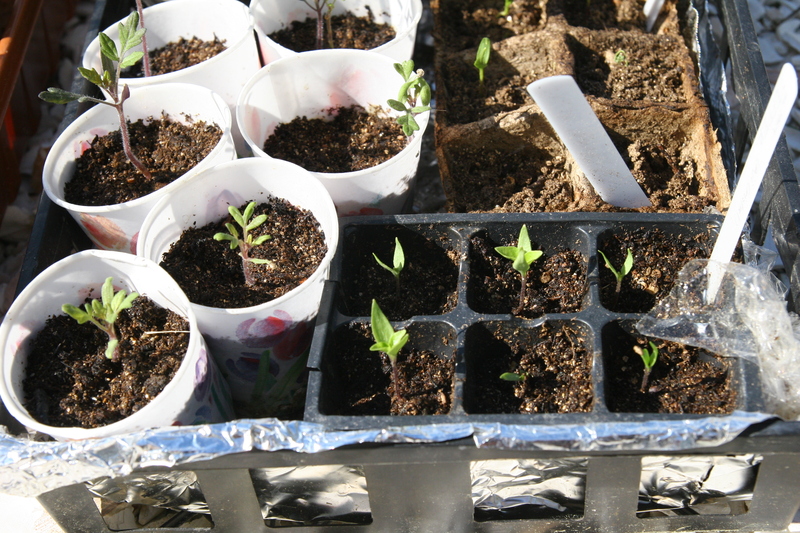 To encourage germination, the trays were living in the utility room where the boiler is for extra warmth. But it would seem that I didn’t get them into full sun quickly enough, because these guys were seriously leggy (long legged and spindly, with teensy leaves). I guess they never really hit their growth spurt, because over 2 months later they are still only showing their 2nd and 3rd “true leaves.” By now, I expected I’d have robust little cabbage, broccoli, broccoli raab (aka brassicas) and other cool weather plants transplanted out in the garden. I did indeed plant out half of them 2 weeks ago, but the whispy little things withered in a matter of days. They were either choked out by the mulch or just couldn’t handle the transition. Every week since early March, I’ve started a few more seeds in hopes of giving as many plants as I can manage a little head start. Though most of them are in much better shape than those first brassicas, I don’t think these are looking too stellar either. The local garden store has tomato and pepper seedlings 5 inches high with multiple leaves and side shoots…I have serious plant envy. Granted — this is our first attempt, AND we are working with the tools we have on hand (ie, paper cups and some seed starting soil from Walmart) as we decided against investing in fancy grow lights, seed trays and the like. So I can’t be surprised if these guys don’t turn out to be super stars. Nevertheless, I am really counting on a lush garden this year and it’s a bit discouraging to see the wee little plants struggle so. I guess the early burst of hot weather fooled me into thinking we were coasting into summer. But no, it’s certainly spring, as evidenced by nighttime temperatures hovering above freezing. 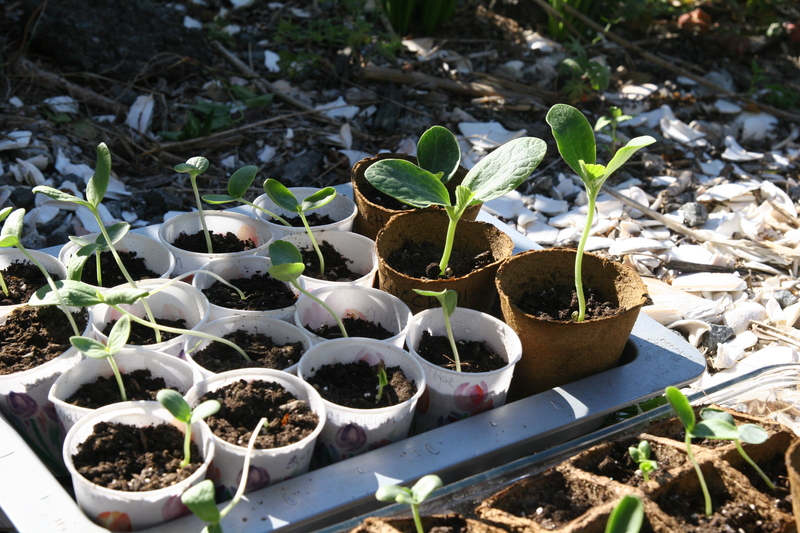 On an encouraging note: check out the melons & zucchini which were started only last week. They look the best of the bunch! But I can’t plant these out until the days AND nights are warm…I hope they enjoy the inside-outside dance for a little while longer!